Some organisations make the mistake of attempting to implement full blown project management procedures without realising the actual level of maturity of their organisation. The assumption is made that because some staff have attended a Prince2 course, that they have some users of MS Project this makes them a project oriented organisation. In many cases the procedures supporting the project management process will be lacking or missing entirely. They may be in place but not actually being used. “In a recent case a local authority made a great deal of the amount of staff who had been passed the PRINCE2 certification and decided they were ready to progress to the next stage of their project management maturity cycle and invest in an Enterprise Project Management system. 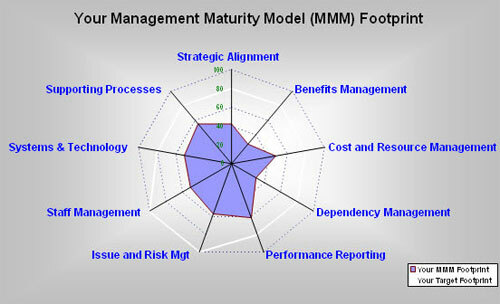 One way to find out how mature your organisation really is and what to do about it is to perform a Maturity Audit. The process involves gathering staff from all elements of your business concerned with managing and day to day running of projects and recording their feedback on the way the People, Processes and Tools are utilised within your organisation. In fact this is broken down further into 9 discrete areas as shown in the diagram below. A report is generated showing the current status of your organisation versus where you realistically wish to be. Recommendations are included within the report which could be used by any third party project management consultancy to improve the performance of your business. The Audit process involves an intensive one day workshop involving all staff involved in the management of projects, followed by three days of analysis and report writing. The final report is then formally delivered by presentation to key staff. A typical one site audit costs £5000. The information returned is invaluable in providing the true status of your PM environment for your People, Processes and Tools highlighting the gap between where you are and where you need to be. The report gives recommendations establishing the way forward for your organisation. The report highlights your strengths and weaknesses, your preferred and most effective capability is detailed and a road map is provided to help you achieve your true project management potential. Can you afford not to perform this process? Contact John Cowie on 0791 787 4739 to to book your audit, or use our enquiry form.